At a book sale in support of your local library, you discover a title you really want, one you've longed to find for years, one you may have given up hope of ever owning. Now it's in sight, now in your grasp, and the price is right, a dollar or two going to a good cause. But you're not happy. In fact, you may be disappointed. You've found something you want, and it's in bad shape. Its tattered dusk jacket bears the volume's former shelf address as expressed by Dewey, its quota of library stamps and pockets and other stigmata attest to years of circulation, its dingy look and grimy feel suggest not so much as a single meaningful cleaning since the day it was cataloged. There may be evidence of many readers, from fingerprints to dog-ears to marginal notes. This has happened to us so many times that we've outgrown every reaction but the urge to rush the book to the cashier and then back to what we think of as our M*A*S*H unit, our medicine chest for ailing books. 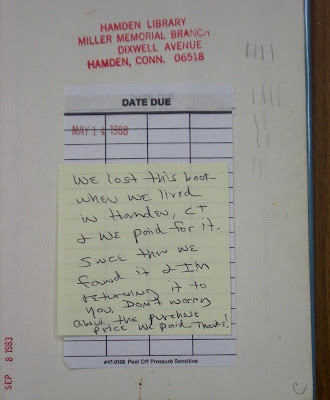 Is there a dealer or collector out there who can't recall, and weep and recriminate as the story unfolds, a book that wasn't bought because it was in poor condition, often because it was ex-library, with all that term entails? The remedy for the human condition is simple: see the book, buy the book, especially at library sale prices. Remedies for the former library book's condition are more varied, but not much more complicated. One can make a case for preserving library markings. If we support libraries, must we necessarily eradicate all trace of them from books they discard? As the computer age changes how library books are managed, old-fashioned pockets may become a relic, and they can be handy for holding your bookmark while you read or for housing notes. Library stamps and other markings, often including perforations, are meant to be permanent, and usually are. At the very least, library rescues need basic cleaning. Many of these books have had hard lives, so while the need for cleaning may be obvious, so should be the need for extra care. Never forget that the more effective the cleaner, the more abrasive it can be, and the wearier the book, the more it must be spared abrasive cleaning methods. Start with the usual soft cloth, then move on as needed to the Artgum eraser and other famous brand names in the field. If you're determined to remove a library pocket, you can try such products as un-du Label and Tape Remover, followed by a minute or two of low heat from a hairdryer. The multipurpose Document Cleaning Pad can help in removing residue. Rehabilitate enough library books, and you'll become intimately acquainted with rubber cement. To cope with its removal, try a long-lasting crepe rubber eraser called Pik-Up, which works on many other adhesives, too. Dust jackets, often encased in heavy-duty plastic covers complete with library labels or other markings, can be refreshed with a cleaning, mending if needed, and a new clear plastic jacket cover. We've found many library dust jackets badly creased and wrinkled, and have probably smoothed and ironed more jackets from library sales than from any other source.